Rosetta Stone courses are some of the most talked about within the field and it’s really not hard to see why. Many other language courses have tried to emulate the innovative methods that they use, and have failed. The practical fact of the matter is that Rosetta Stone programs are in their own league, using what they call the “total immersion” approach. Unlike other courses and programs that attempt to re-create this with a sea of indistinguishable phrases and confusing layouts, this program relies primarily on using the connections that your brain makes between pictures and words to its advantage. As you might expect, the Rosetta Stone packages come with a lot of additional extras. Well, for that price, they’d better! As well as the accompanying audio CDs, there is also a USB headset with a microphone. The best language courses use vocal recognition software, so to have the package come complete with a headset is really just very useful. The headset itself comes with a fancy array of settings, so you can set the sound and reception to however you speak. Similarly good, the vocal recognition is not bad, and picks up on subtle mistakes that other pieces of software might have missed. Still, again considering the cost, one would really expect absolutely flawless equipment and software, and while everything is very intuitive and easy to use, certain parts of the vocal recognition software just aren’t as precise as they might be. 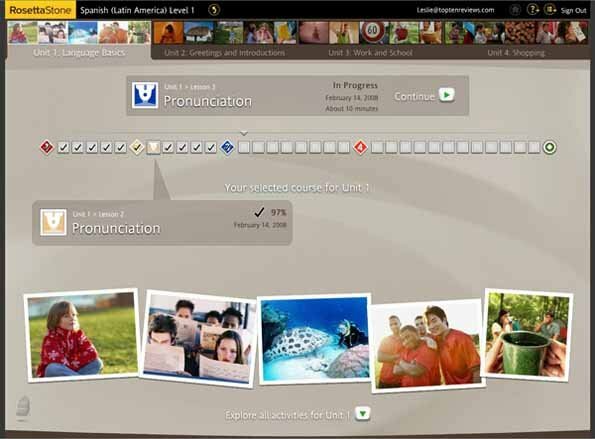 There are three Levels to each language taught by Rosetta Stone, and each Level contains four lessons. Within these lessons there are several units. The layout of the course is so tightly structured that it really helps you to keep on task with what could be the difficult job of trying to learn a language without a real teacher. And yet, despite the layout being so strict, because of the style of teaching there really is a strong interconnectedness to the whole method of learning. Because Rosetta Stone really is geared up to utilize the way we learn as children, it is no surprise that this is a very effective study aid for those who are younger. A bit of an expensive study aid, perhaps, but if you want your child to become fluent in more than one language, then this is certainly the program to choose. However, as an adult, it is much more difficult to say whether this program will be of any use to you or not. 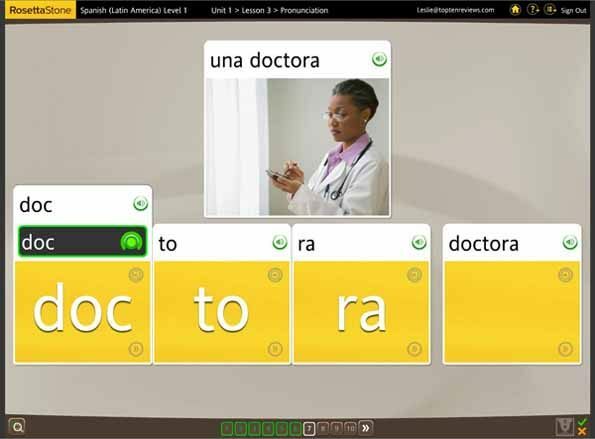 There is the argument that Rosetta Stone programs are just glorified flashcards, and to an extent that is absolutely true. That is not to say that it doesn’t work, however. You look at the pictures and through your logical. It certainly is hard to jump into, but has the added bonus of the fact that the more lessons you do, the more you feel you are picking up and not just in an informational sense, but in the sense of really beginning to understand how the language works. However, if you are one of those people who needs to know the science behind something, then this isn’t the course for you. 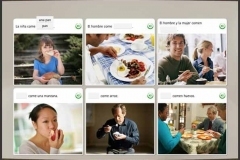 Written words are avoided at all costs, with Rosetta Stone programs relying on a series of games, flashcards and exercises that all follow the same theme: match up the picture with the spoken words. Grammar is not given any importance whatsoever, beyond you figuring it out for yourself. You are supposed to be able to learn to associate what you say with what is in front of you, linking the image in your mind with the correct pronunciation of the object. This has some obvious drawbacks, such as it not always being clear what the pictures are trying to show. You can be looking at a picture of a red ball for ages, and not realize that what you’re supposed to be focusing on are the children, or the kind of game that they’re playing. A simple solution to this is to have a dictionary with you while you are learning, so you can run through the possible answers, but for the amount you’re paying for this course, it’s the sort of thing you really shouldn’t have to do. There are no explanations for the pictures themselves, and no external information that helps you to understand any of the potentially more complex grammar aspects of learning a language. Still, overall, the pace of the lessons is excellent, with a lot of re-capping previous points and making sure that you understand the right lessons that have been taught. It’s pretty focused on vocabulary as well, and you can really start to feel that having an effect on the way that you think about the language, even if you won’t be able to form complex sentences yourself by the end of the course. It certainly isn’t the kind of course that you pick up for a few weeks before you go on holiday; it is definitely the kind of program that you buy if you want to really immerse yourself in a language, and plan on using it in the long term. And here is the major flaw with Rosetta Stone. Yes, you can find countless positive (and negative) testimonies for this program, but the fact of the matter is that this is probably going to be a way of studying that you simply haven’t encountered before. It is not particularly familiar, and it certainly isn’t something that you can just dive right into. You need to shift around the way that that you think about language in order to even get the concept of the way this course is presented into your head, and as such, it may be a colossal waste of money. It is the most expensive at-home course that one can purchase for this kind of language learning, and costs hundreds of dollars, even with sale prices. While it is absolutely worth it if you are the sort of person for whom this kind of learning can work, I definitely advise trying it out before you buy. Their website sometimes offers trial periods to use the software, or perhaps you know a friend who has purchased from them. Either way, by hook or by crook, you should trial run the software first, because if it turns out that you have difficulty in receiving information in this way, then there still isn’t an alternative in the programming. You learn it with pictures or you can’t learn at all. Amazon often knock a couple of hundred off this course, and you can get a very reasonable discount if you buy second hand. The good thing about a love it/hate it course is that there are plenty of high quality second hand packages to buy, because some people really don’t get on with it and just want to sell it on. An additional point to make about cost is that you can buy the levels of tuition together or separately. It’s a very good idea to figure out how far you want to take the language before you buy, perhaps with a much cheaper course to start with, because you could end up paying up to $350.00 extra for all three levels of the course if you buy them separately. You don’t want to start learning after paying for all three levels, then realize you don’t want to learn this language, and likewise, you don’t want to end up paying for Level One and wish you’d opted for the full package. For the cost, I really feel it should be working for the majority of cases, which considering other feedback, I’m not sure it does. Make no mistake; if Rosetta Stone works for you, it’s going to work absolutely fantastically. The problem lies in the fact that this sort of learning just doesn’t appeal to everyone, and not everyone can use this method of learning to their advantage. It relies solely on the way that we learn language as children, so it’s not hard to see that the obvious drawback to the program as a whole is that most of the people purchasing this are not going to be children. The way we learn as children is completely different to the way we learn as adults, and for most of us, that’s simply because we cannot process information in the same open-minded absorbent way that we do as children. We have already learned a language, and to most of us it will make no sense to start from the beginning without putting some of the already learned skill of a first language like English to better use by using it to help us learn a second. This is why I would not necessarily recommend this package to everyone; it is so very specific in design that if you even feel a little like this is not going to work for you, then it probably won’t. And it’s a heck of a lot of money to spend on seeing whether it’s for you or not. Still, if you can get your head around the concept of learning in this manner, then Rosetta Stone courses will be fantastic for you. While I appreciate the feature of speech recognition and it only functions slightly well with Mac, the entire application leaves some matters to be adored when it talks about the real efficiency in understanding French. Except that during your childhood, you have been immersed already in the French environment 24/7, immersion as a sole technique is not as efficient as enhancing your skills of English language to study French. Even though I have learned some things with this course, I still felt discontented with Rosetta Stone. I settled on taking a French course at the local community college and that was the time that I clearly realized how much more efficient it would be to be in a real classroom. Basically there are just several rules and idiosyncrasies in French language that is not instructed in RS. Having a professor explaining you things such as in a classroom setup or through the great Fluenz language program create a more effective method of learning. This is not to mention that RS is impractical. I strongly believe that RS is efficient but only as a complement to a classroom setup or program which really instructs you the techniques in English. I bought Rosetta Stone French for my two kids and I have to say my kids enjoy using it and also make some progress. I hope they will stick to the program, because it was not cheap at all. But I guess it is worth it! I got this product for extra lecturing and it is full of crap, packed with bugs and stays crashing. The headset is not useful and it rejects to keep track of my development, which obliges me to restart all the time. I definitely recommend that you buy a book if you really want to learn how to speak Spanish. After visiting Spain this summer for some weeks, I was enticed to study the Spanish language. I bought Rosetta Stone version 3 (1 to 3). The installation and setup for the headset went pretty well. The program is alright for me; however, I discovered some areas which are not very instinctive on what the application is requesting you to do. Majority of the program functions as what has been advertised. 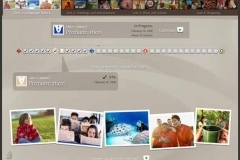 The application consists of repetitive speech with matching of images with words and lets you to repeat the words on your pc to confirm your accent. This attribute is very good as it lets you verify how you are properly pronouncing the French terms. It is difficult to foresee whether the matching of pictures to words would actually let you speak a second language in the long run, but who knows? 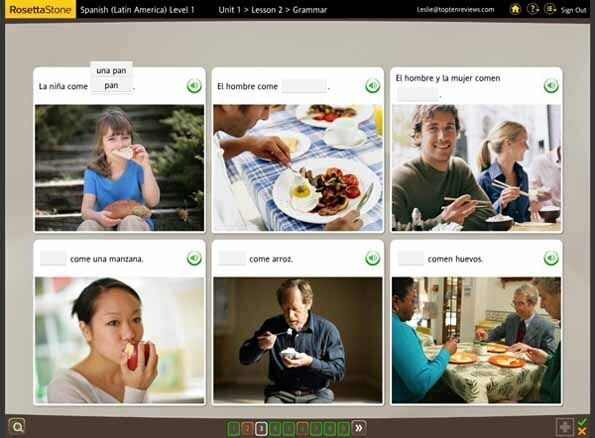 As with studying a second language, it takes some time and commitment when you are using an application such as Rosetta Stone. Some favored the RS and some did not like it. I totally did not bought the product because on how it appears and basically I got it to help me study another language. I love the simple method of this product and I am able to chitchat now in Spanish. I settled on buying the Rosetta Stone due to the convincing ads on TV. The decision was speed up because of the 120 day return guarantee. I started the program to simply learn small words like bike and apple. After completing the first level, I gained very small knowledge of the chosen language. Alright, I have learned to utter red apple, but not the way to request for a red apple when I’m at the restaurant. There is no explanation for any part, particularly the grammar. Possibly you have watched the commercials where you will match the words to the images and those are the content of the 3 levels. You will simply choose the word that is equivalent to the image. Soon you will jump to the phrases, however, the words inside the phrase are not explained and no translation is obtained. With this language program, you will only acquire the fundamental proficiency and I anticipated more for its cost. If the cost were half of what it is marketed for then I would suggest that it is value for money. I find that there are no English explanations about how the grammar is constructed. Even as I have completed the 3 levels, still I was not able to make a good conversation. -It is build to also fit the needs of little kids…its not optimal for grown ups. -Slow paced and has numerous repetitions. I shouldn’t have bought the Rosetta Stone. -The technique is not effective as what is being advertised. For instance, the sentence and grammar structure stays vague after you have finished the course. -Software contains several bugs particularly in the voice recognition, which would definitely drive you crazy. I hate Rosetta stone. For instance rosetta shows a picture of a man on a horse and says caballo…. doese that mean horse, man, rider, rancher or what? It means horse, but it would take me a long time learning that way. It would be good for someone who didn’t know english as there are no explanations for anything. I too tried Rosetta stone ( French ) and found it to be overpriced,and overhyped. I am looking for a good language software package. 1. Speakers are native but understandable with standerized pronounciation. 2. Teaches everyday grammer and applies grammer as a “short cut” tool to speed up learning. 3. Incorparates a syllabus of material on the CD, a guidebook and exercise book. 7. CD dictionary with verbs and nouns with at least one spoken phase for each. I don’t know about other languages,but for spanish it works fine. Well..i have a little help from my spanish friend:).But anyway i think that RS is a good program.It isn’t that easy to learn a second language,so even for a bacics RS is worth of trying,buying or whatever..When i finish with this course,if it shows that it wasn’t enough,what?I will take another one.buy other program or i don’t know..
After completing Level 5 in Rosetta Stone, I travelled to a country that spoke this language for a two week vacation. Since I was visiting friends who lived there, I wasn’t forced to speak very much. Whenever I listened to conversation, I could very easily follow along and practiced forming my own response even when someone else was doing the talking. I got the most practice at the market because our guides couldn’t be with all of us at once. Don’t get me wrong, there were many words that I couldn’t understand. At the same time, I seldom got stuck trying to say something. I think of it as having built a good foundation upon which to begin to REALLY LEARN. 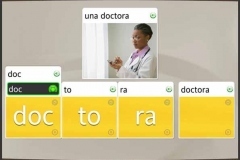 Although Rosetta Stone’s teaching program seems random in Levels 1 and 2, things really start taking off in Levels 4 and 5. When you’re done with Level 5, you’ll be able to understand things that weren’t even taught in the course. That’s because Rosetta Stone doesn’t just teach language, they teach you how to learn a language. Again, Rosetta Stone is the best thing you can do before living abroad. I give it 10 stars! I’m the person who went through two or three boring Spanish classes, bought books on learning Spanish. spent money trying out various CDs, borrowed CDs that were already in heavy demand at the library, and so on. So you can imagine just how frustrated I was by the time I decided to buy RS on the glowing recommendations from people I knew who knew people who used it. I was even told that the U.S. military uses it. Why else did I take this course? Well another reason is that I’d like to speak the language with the people who live around me. If I travel to another country, great, but right now I’m concentrating on the immediate future rather than something long-term. I anticipate more Spanish-speakers to be moving up from Latin America (and also getting to know the Native North Americans who also speak Spanish), so unlike others, I welcome the chance to relate to them on their own terms. Right now, I don’t care about the mechanics of how the language works. If I can understand the other person (and vice versa), it works for me! And it has so far. I’ll get to the boring “how it works” part later. I get bored easily. I bought this without any farfetched belief that it would be the be-all and end-all to my learning Greek. That was the right attitude. It’s interactive and thus “fun” (not fun in the sense of a game, but it keeps you clicking and trying to get it right). If I were to try and slog through a book or sit through a lecture, it would be a chore. Plus of course, I can do it any time I want. I can hear native speakers speaking the language, and it makes me say it back. I can’t even be lazy and think I won’t bother this round because they throw it into like every level. On at least some parts, you can go into a separate speech area where the person says it slowly so you can really work on it. They never explain the alphabet because the point is to get it as you go along, and that does sort of work. In short, there are many positives to this over a big book or a class, especially when you work and so on or when you feel like practicing at 2 am. I know the point is to not explain grammar because you’re supposed to pick it up, but honestly, how do you depict “the” versus “a”? Answer, you don’t. I’ve had to look that stuff up. I totally misinterpreted “not.” And my brain overran the software, seeing “nei” as no instead of yes and then getting very confused. It tries to get across concepts with other concepts, like “the girl is walking” or whatever, but when you pick the right answer, you base it on the presence of “girl” in the sentence and then find you’ve never learned the rest. A few things are never reviewed as well as they could be. We get “girl” and “boy” like crazy, but some stuff gets glossed over. In the same way, it could test you better, in the same fashion, by presenting different versions with the right words but only one correct verb form, rather than your choosing the right answer from the noun. Anyway, it’s tempting to think you can “play” through it, as I’ve tried to, but I’ve gone back and done level 1 stuff about 50 times and will continue to do so until it’s embedded in my brain. All in all, it has its uses, but it’s not a perfect solution. I’d see it more as a useful tool along with books or websites to help explain the parts that throw you off. 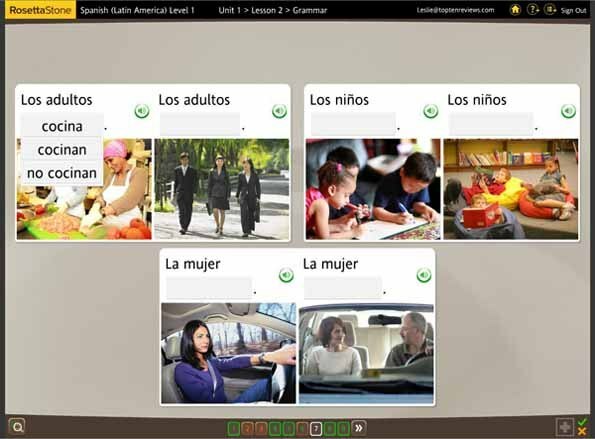 I purchased rosetta stone for spanish because my wife is Colombian and I had heard her speaking spanish daily for a few years and thought I should learn it.Well I got 1 through 3 and its been 6 months and Ive never finished 1 as of yet.I keep reviewing things beause I thought I was supposed to learn spanish,as in speak spanish but I sit and click photos of things and hope for the best.At this point sentances are getting a bit longer and rosetta adds new words that were never mentioned until they are on your screen to a sentance but I dont know what they mean.There is not a way for me to know what they mean unless I ask my spanish speaking wife.In other words if I didnt have her Id never know what the words are.The program I got came with a headphone and mic setup but in 6 months Ive never gotten to use it,its never asked me to plug it in other than setting up the software.6 months into rosetta stone for spanish I speak no spanish at all and Ive never finished lesson 1 of 3.This seems to me to be a horrible way to learn spanish. So far so good, yo estoy usando Rosetta stone y estoy en nivel dos de esta software. 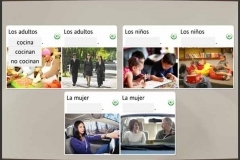 No es fácile pero yo creo en Rosetta stone y espero que después de completir nivel cinco. Voy a aprender mucho por lo menos algo. First finish all five levels and then give your opinions(I believe most of those who buy rosetta stone they do not read clearly level one is for basic vocabulory only and so same goes with other levels as well, read carefully and make sure before buying it that how can you be dedicated and loyal to it. Otherwise you won’t learn anything, it’s just better to buy pimsleur if you want to learn some frases. It’s all about dynamic immersion. Atleast you need to give one hour everyday and should use it regularly for 5days in a week. People they don’t complete it and just start commenting y a mi no me gusta cuándo esa persona no sabe nada y quiere dar su adviso. All five levels are of 250hours. In one day no one can learn anything. Polyglot:- I speak Hindi,English,Nepalese, Urdu and Un poquito español(Yo estoy tratando de aprender). To be fair, I really haven’t spent much time with Rosetta Stone. But to be equally fair, part of the reason is that it really didn’t appeal to me. I didn’t like being stuck in front of a computer, preferring all-audio systems (like Pimsleur) that you can use in the car, supermarket, walking the dog, and so forth. I do have a friend has learned a lot of vocabulary from Rosetta Stone, however, so I’m sure he’s not the only one who has found it useful. ulary, but Rosetta Stone doesn’t teach grammar at all, which is a huge oversight, in my opinion! They strongly believe that using pictures and matching them with words or short sentences, is going to enhance one’s ability to learn the target language. It doesn’t. I have been using Fluenz which is far superior in that it takes the time to explain German grammar in English in a very thoughtful, precise way. Please people, do not waste your money on Rosetta Stone! I found this totally worthless. It’s incredibly slow-paced and the Turkish version includes mistakes. I have tried Rosetta Stone on 2 different occasions and both times experienced the same dismal result!!! It might be effective for young children but for adults its a waste of time and for sure, money! The fact that grammar isn’t stressed is a major problem. How can you understand a language if you don’t comprehend the grammar or the foundation? Sentence structure is also lacking in this program which is also disappointing. I am trying to learn German and both grammar and sentence structure are essential to mastering German. I find Fluenz much better because of its emphasis on these 2 concepts and its emphasis on tailoring the instruction from an English perspective with a tutor and many exercises included including flash cards. To summarize: Great idea implemented incredibly badly. If you add price – its a complete rip off. Lamentavelmente comprei esse programa 2 vezes, por ter gostado do metodo. Da primeira vez comprei por $500.00 com DVDs, e nao conseguia ativar, precisei gastar mais de 1 hora , varias vezes com o agravante que precisa de alguem que falasse Ingles pra me ajudar, Agora desiti do programa que tenho e resolvi comprar outro “online” imaginei que seria mais facil. Diziam que bastava cadastrar seu email, puro engano. Voce precsa de um codigo de ativacao, claro, so que o codigo nao funciona, entao vc precisa de apoio tecnico, que ” so fala Ingles” Se vc esta comprando um programa pra aprender Ingles, como vc consegue reclamar e ativar em Ingles. Portanto fica aqui a minha real frustacao com este programa. To be fair, I haven’t used the most recent version with on-line connection to real people. I have used Rosetta Stone and Pimsleur for Spanish. I have also taken Spanish at language schools in Latin America, read Spanish literature, and taken college courses. I am currently taking Spanish lessons via Skype with an instructor in Guatemala. Of all these methods, Rosetta Stone was the least efficient, meaning that I learned the least per amount of time spent. Yes, I ‘m sure it works for some people, but we’re all busy, and the trick is to find a method that gives the biggest bang for the buck. For getting a working knowledge, Pimsleur is by far the best for a beginner. It has a huge advantage over Rosetta Stone, even ignoring Rosetta Stone’s other failings, which is that it is aural only, so you can do it in the car and don’t need to be tied to a computer or other device. Even though I’m now an advanced student, I still use the Pimsleur series to brush up and improve my fluency regularly when I’m commuting to work. But much better than any canned program, that must be one-size-fits-all, is a private one-on-one tutor. When I was in various language schools in Latin America, I quickly learned that small group lessons were not cost effective. You can learn that way, but you learn less per dollar than you do with private lessons that fits your needs. I am now taking lessons via Skype with a great tutor in Guatemala that costs only $12 per hour — much more cost effective than any canned program. That’s 40 hours of private tutoring for the cost of Rosetta Stone. I have two degrees in education and found RS (Italian Levels 1-3) very helpful as they use a total immersion approach (speak, read, listen). That being said, I am most disappointed with the company’s policy regarding access. In order to play the DVD’s you need to first download an app from their site using a code unique to your product. I purchased level 2 DVDs at the mall before RS had an online presence (about 12 years ago). I paid a lot of money for MY DVD’s and cannot play them today. The company says they no longer support the older, Version 2 platform. I do not want to pay for 3 month online access to activities I won’t use. All I want to do is play MY DVD’s without giving them more money. I have spoken with two RS tech reps about this to no avail. They use the broken record approach informing me that I need to spend more money to gain access to play MY DVDs. DVDs I already paid for. Currently RS is selling customers levels 4 and 5 platforms. Therefore customers will have to continue to pay additional money to upgrade over time. I read through the user booklets that came with my purchase. There is no indication or disclaimer informing customers that they will need to pay more money to upgrade platforms. All I want to do is play MY DVDs. I paid a lot of money to own them and should have the right to play them throughout my lifetime without dishing out more money to RS. Access to MY DVDs should be grandfathered without additional cost. Disappointed with the company’s ethics and core values.